Sonic documentary for the most serious matters and the most optimistic outcome of political affairs. A joint venture of composer Boris Bergman, who used to write for the likes of Dalida and France Gall, and singing drummer Sylvain Krief, this album defies both artists’ regular output. Moving away from pop-oriented oeuvre, they created something much more monumental, although it’ll take a few spins of the record to get fully immersed in its intent. The title suite that took the entirety of the LP’s first side is tremendously impressive in its tying together of abstract passages bordering on musique concrète, with spoken word and snippets of radio programmes woven into an avant-garde tapestry, or rather aural newspaper, and precise melodies such as “Hatikvah” – the national anthem of Israel – or lighthearted vocal harmonies. 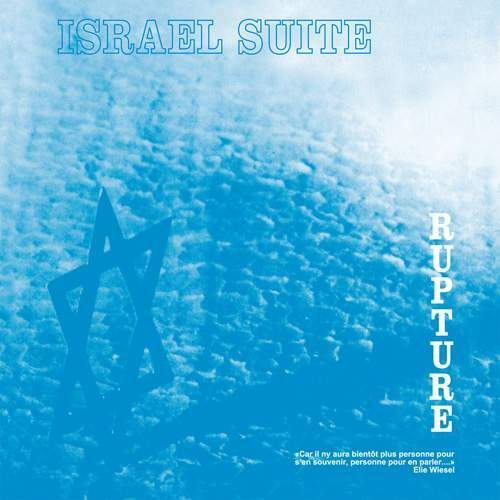 In a reflection of a stroll along the seaside, where the Mediterranean is a link between Tel Aviv and Nice, sunshine songs rub shoulders here with bursts of loosely jointed piano chords which gel into the equally breezy jazz before other instruments dissolve it into brisk fusion and then into bass-led anxiety to paint dramatic historical events. The tension is dropped for good afterwards, once the bossa-nova-tinged funk of “Mes Histories Bleues” signals return to frivolous romp, and “Voyage Sous La Mer” pours romantic aching in the psyched-up jive, yet the same approach to “Alice Aux Miroirs” wouldn’t really work wonders if not for the splinters of guitar twang flying all around, while the voices and arrangement of “Autre Fois” offer ’70s European MOR at its most trite. So it’s only the woodwind-warmed “Entre Ses Cils” that sounds as sincere as the epic on the other side, but this is where contrast becomes the link which chains all the pieces together. A bold and riveting work.